Celebrate National Dance Day in the USA with KDA on July 27, 2019! KDA is hosting the biggest National Dance Day celebration in Kern County by setting the dance floor on fire this summer with dance classes, giveaways, yummy snacks, and cool drinks. Dance classes are taught by dance educators from across Kern County and will vary from beginning to advanced and range in dance styles. From Zumba to Hip Hop, Country Line Dance to Contemporary, dance classes are open to all community members, dancers and non-dancers, who want to join in the fun! KDA members enjoy National Dance Day classes for only $1 a class! Check back soon for the NDD 2019 schedule! Beat the line on National Dance Day and register ONLINE! All online pre-registrations will receive FREE KDA swag! Walk-up registrations are available on July 27. NATIONAL DANCE DAY IS A CASH ONLY EVENT– please bring cash or check for all National Dance Day payments. Credit Card purchases will not be accepted. Arrive 15 minutes early to ensure enough time to register for class! NDD classes + teacher biographies will be posted soon! 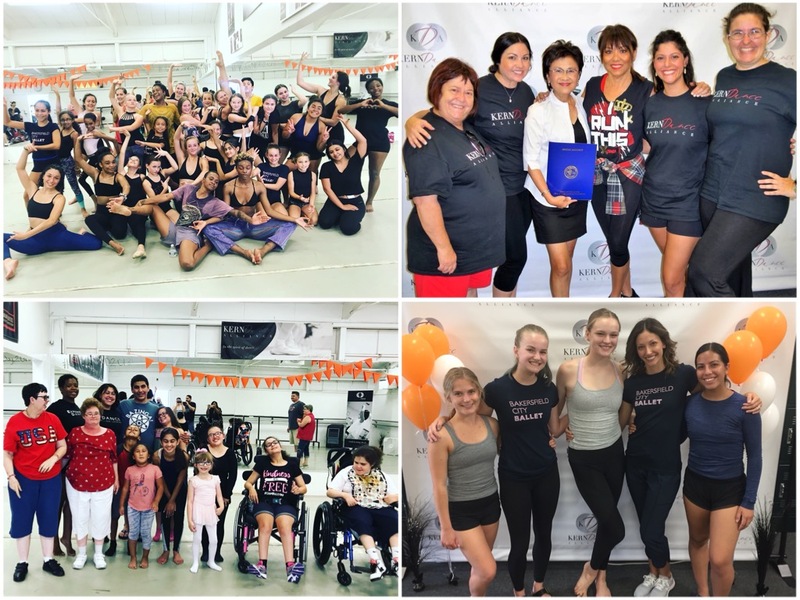 Established in 2010 by Dizzy Feet Foundation co-founder, Nigel Lythgoe, National Dance Day is an annual celebration dedicated to dance, that encourages Americans of all ages to incorporate dance into their lives. By creating a focused day of celebration, the Dizzy Feet Foundation and Kern Dance Alliance aims to educate the public about dance and its many benefits, as well as make dance accessible and inclusive to everyone. Kern Dance Alliance and the Dizzy Feet Foundation believes that participation in dance connects the mind and body, promotes health and wellbeing, connects us with others and enables us to find joy through dance and movement. National Dance Day (NDD) is a day of celebrating dance, in all its forms, and takes place annually on the last Saturday in July. Information courtesy of the Dizzy Feet Foundation. Each year the Dizzy Feet Foundation produces and distributes instructional video/s featuring dance routines offering participants, across the United States, a free opportunity to learn an original choreography, uniting dancers and dance enthusiasts everywhere, by performing it wherever they are as part of a national day of dance. Created by well-known choreographers and featuring dancers from popular dance TV shows & movies, the National Dance Day routine is aimed at a range of dance abilities to ensure everyone can participate. NDD 2019 choreography video will be posted soon!